To avoid making this too philosophical, I won’t bring up any scriptural quotes. Let’s discuss the other side of the story, a purely practical perspective. Last year, I went to Argentina with my wife and we were staying at the home of one of our disciples. I remember in our room there were some posters of boys plastered across the walls. The disciple’s two teenage girls, who were becoming spiritually inclined, were meeting my wife for the first time. They had to break the ice somehow, find some common ground, so my wife started talking about the boys in the poster. That’s when I came to know that they were members of a music group called One Direction and that they were quite famous amongst teenagers. Apparently, none of the members of One Direction were from Argentina. In fact, they are a British band, but still, their music acted like an icebreaker, allowing my wife to engage in a happy conversation with these two teenagers. I heard that there was always a huge social gathering when this group sang, and that the crowd was a real mix of people from different backgrounds, religious faiths and social statuses. This is the effect of music: it brings everyone under a single shelter. These practices are not easy for most. For example, you need physical and mental purity to perform Deity worship, you should listen to the Shrimad Bhagwatam from a qualified speaker,and you need to develop a taste for hearing the stories, and meditating on the pastimes of Vrindavan can be affected by many external factors as well as the purity of your own heart. To really understand and enhance the quality of these practices, you need very specific types of association. But this can create divisions amongst devotees. To overcome these awkward situations and to bring harmony, Shri Chaitanya Mahaprabhu gave us sankirtan. Mahaprabhu was the greatest social reformer of all time, because He knew that spiritual practice with simplicity brings great changes in people. 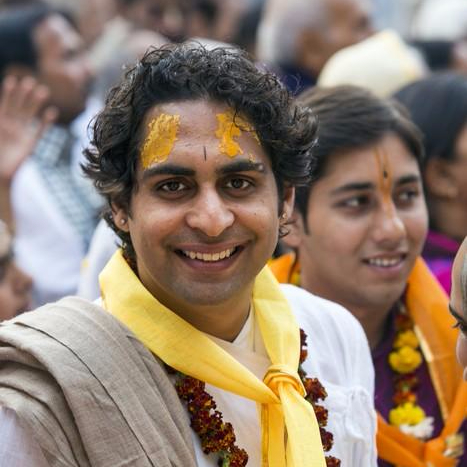 If you attend sankirtan, you are continuously chanting the Holy Name. Sankirtan gives you the association of devotees without discriminating on any level because everyone loves music, and to practice sankirtan you don’t need to be a musician or belong to any level of devotion. Sankirtan is the ripened fruit of the  Shrimad Bhagwatam, so if you perform sankirtan, you are fulfilling this practice as well. According to the Bhagwatam, chanting the Name of Krishn is a form of His worship, so you are performing Deity worship too. And when you sing or attend sankirtan, it automatically transports you to Vrindavan. Sankirtan encompasses all of the five practices mentioned above. And it brings everyone under one shelter. 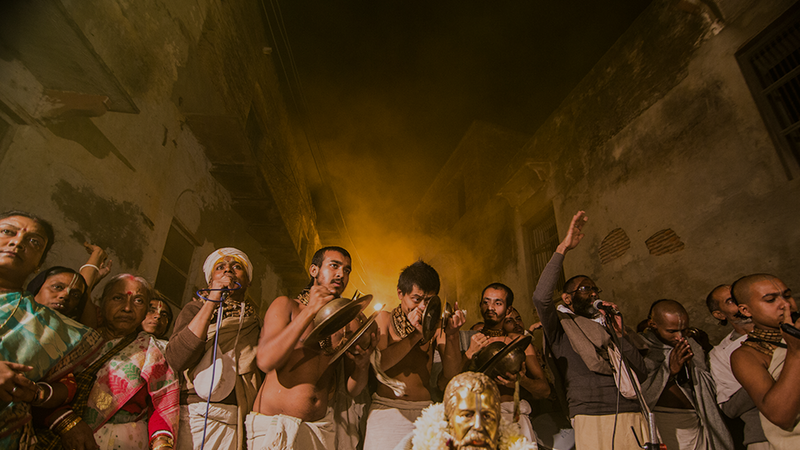 Sankirtan is called the worship of sound through sound. All that Mahaprabhu asked for was sincerity in this practice. By doing this, you will become boundless and reach the highest state of love. So, this practice of sankirtan is simple, yet it is an important and sincere offering of sound that we make to Him with the mood that, “I belong to You, my Radharaman,” in the same way that Mahaprabhu did as he raised his arms in ecstasy and sang before his Beloved.